Connect your MoBerries account to SmartRecruiters. Discover the advantages of ATS integration. 1. Head over to the Integrations tab on your MoBerries dashboard. 2. Your Company ID can be found in your Smart Recruiters account under Settings / Admin, on the left side, under your company logo. Please copy the exact name and enter it here, then click Connect. 3. You can now connect your job postings through both platforms! 1. From MoBerries platform, Go to the Jobs Tab and select +Create Job. This is the option we recommend for immediate connection between SmartRecruiters and MoBerries. Prerequisite: your job posting needs to exist on SmartRecruiters. Note that the connections can be edited at any time. 2. Select the relevant SmartRecruiters job title from the drop-down menu. 3. Your job description will automatically populate with information from your SmartRecruiters job posting. 1. Go to the Jobs Tab and click edit on your MoBerries Job Posting. 2. Select the relevant SmartRecruiters job title from the drop-down menu. Edit your MoBerries job and save. 1. In your SmartRecruiters dashboard, select Jobs. Click on Advertise on the job posting you wish to connect to MoBerries. Type and select (Add) MoBerries from the list of Job Boards. 2. The Job Posting for MoBerries will now appear in your Cart. Click on View Cart, then Checkout and Proceed. As a MoBerries partner, no additional fees are connected to your integration. Allow up to 24 hours for your integration to go live. 1. You can also connect your SmartRecruiters' Job Posting to one on MoBerries by selecting a particular posting and navigating to Sourcing. 2. In the Job Boards section, select Browse More. Type and select (Add) MoBerries from the list of Job Boards. 3. The Job Posting for MoBerries will now appear in your Cart. Click on View Cart, then Checkout and Proceed. As a MoBerries partner, no additional fees are connected to your integration. Allow up to 24 hours for your integration to go live. Note that we recommend you to connect Job Postings through the MoBerries platform to avoid waiting time (job description going live). Learn how to connect through MoBerries. 1. Review your pending job matches on your Dashboard. 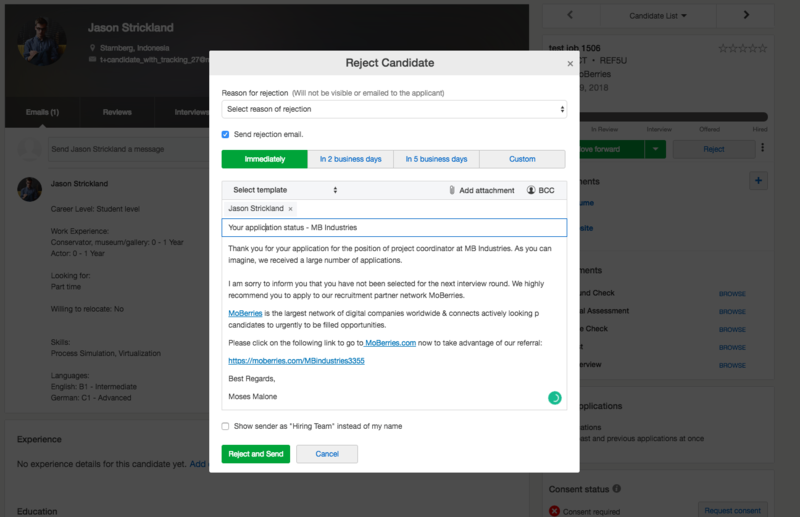 You can connect your SmartRecruiters and MoBerries job postings through MoBerries candidate view (if the candidate matched for a job posting not currently connected to a SmartRecruiters posting). 2. 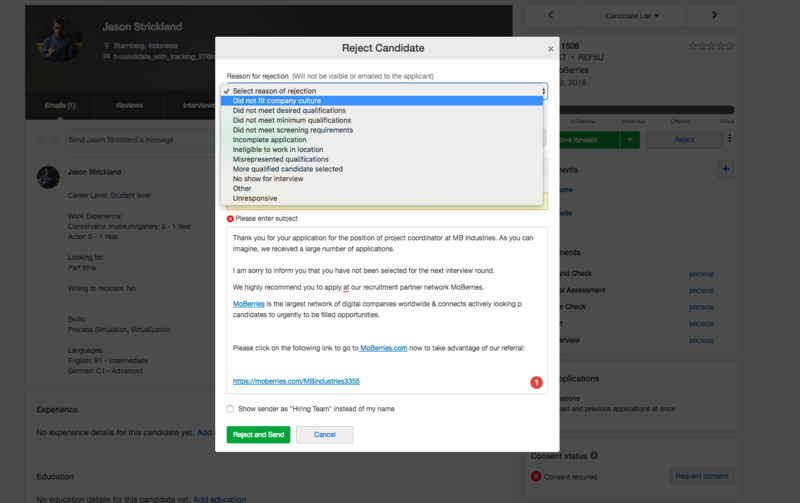 Click on Connect this job to your ATS to enable automated profile export. 3. You will be taken to job description edit mode, where you can select your SmartRecruiters job title from the drop-down menu. The candidate and all further matches for that job posting will be pushed to SmartRecruiters. 1. Add MoBerries' sharing template into your SmartRecruiters rejection notification. 2. Effortlessly provide feedback from within SmartRecruiters for your declined candidates. This information is taken into account by the MoBerries algorithm to improve your sourcing. Streamline the exchange of candidates between your platforms to hire faster and smarter. Need a larger variety of candidates? Use MoBerries as a reliable source of pre-filtered and actively looking candidates.